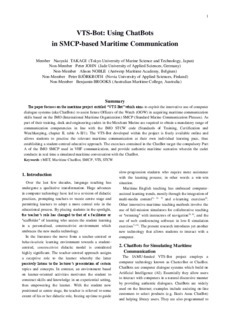 The paper focuses on the maritime project entitled " VTS-Bot " which aims to exploit the innovative use of computer dialogue systems (aka ChatBots) to assist future Officers of the Watch (OOW) in acquiring maritime communication skills based on the IMO (International Maritime Organization) SMCP (Standard Marine Communication Phrases). As part of their training, deck and engineering cadets in the Merchant Marine are required to obtain a mandatory range of communication competencies in line with the IMO STCW code (Standards of Training, Certification and Watchkeeping, chapter II, table A-II/1). The VTS-Bot developed within the project is freely available online and allows students to practise the relevant maritime communication at their own individual learning pace, thus establishing a student-centred educative approach. The exercises contained in the ChatBot target the compulsory Part A of the IMO SMCP used in VHF communication, and provide authentic maritime scenarios wherein the cadet conducts in real time a simulated maritime conversation with the ChatBot.